A metal operating instrument having an edge of sharp, toothlike projections, for dividing bone, cartilage, or plaster; edges may be attached to a rigid band, a flexible wire or chain, or a motorized oscillator. (saw) a cutting instrument with a serrated edge. Gigli's wire saw a flexible wire with saw teeth. Gigli's wire saw as used in removing segment of the skull. Orthopedics Any of a number of manual or electric devices with a serrated cutting edge, used to cut bone and/or hard tissue. See Stryker saw. n a cutting blade with a toothed edge used to cut material too hard to slice with a knife. 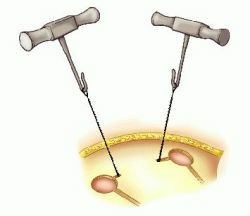 n.pr a flexible wire with teeth used for osteotomy procedures; often used in blind operations. n an instrument with a thin sawlike blade used for removing surplus metal from the contact area of gold-foil restorations. n.pr a nasal saw often used in ramusotomy of the mandible. n.pr a saw consisting of a thin, replaceable blade held in a frame; used to trim gross excess from the proximal portion of a Class II foil restoration in the preliminary stages of finishing and contouring. n an oscillating blade in an electrical or compressed gas-driven unit; used to cut bone. n a rotary blade on a shaft in an electrical or compressed gas-driven unit; used to cut bone. modeled on carpentry tools but made of sterilizable materials; used for cutting cartilage and bone. see wire saw, gigli wire saw. Heir to a mosaic of lands, languages, religions, traditions, social and political structures, united only in the person of the ruler -- king here, archduke there -- Joseph saw virtue only in a unified, uniform state. To his dismay Joseph saw that the Inspector was occupying Fraulein Burstner's room. One can contrast the distance implied between Jacob and Joseph's children with the warmth conveyed in the text regarding Joseph's family: And Joseph saw Ephraim's children of the third generation; also the children of Machir, Manasseh's son were born upon Joseph's knee (Gen.
A standout at Furr High School in Houston when he first became interested in Oregon, and the Ducks in him, Joseph saw his college options fade as recruiters looked into his academics. Jack Joseph saw Sarena Pride give him his 235th winner when taking the Course des Vin de Saumur Nursery.